This is the only prep game for the 2018 WC qualification. 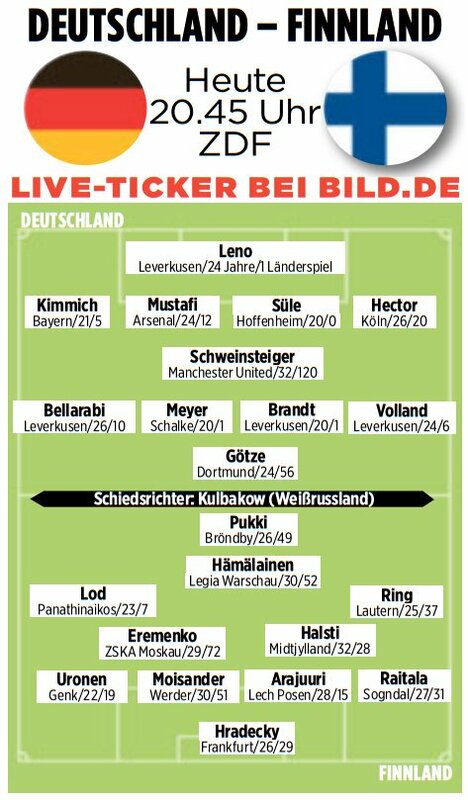 Germany's 1st game on September 4th in Oslo can be tricky considering that the German players are coming back from the off-season while many Norwegian players will be fully tuned since the Tippeligaen does not have a summer break. Although Norway in the past was not too challenging right now it can be complicated at home, I remember that in the Euro's qualification they beat Croatia 2:0 in Oslo and looked like qualifying directly when in the last game they were winning 1:0 in Italy with an early goal until Italy scored twice in the last 15 minutes so they finished only one point (19) behind Croatia (20) that had a hard time beating almighty Malta in the last game. Eventually Norway lost the playoffs against Hungary but for a good reason Germany should not underestimate them for this first game and must prepare with at least one warm-up game and Finland seems to be ideal. Let's keep in mind that the WC qualification is more difficult that the Euros since only the first place in each group goes directly, one loss to start the campaign can be a result that could have repercussions later on. Last edited by Jorge on Mon Jul 18, 2016 5:28 pm, edited 1 time in total. You do know there are 3 Maltese members who can ban you right? I know, secretly I root for Malta sometimes like when they give Italy a hard time. Löw at the PC: "Süle, Brandt and Meyer will get the opportunity to play on Wednesday!" Perhaps you'll be entertained that the U21s will be playing in Finland today week, though for some reason the exact venue is not yet set. EDIT: found here and added to our fixtures calendar. Schweinsteiger will not feature in that game, nor will a host of other players Germany coach Joachim Loew is planning to take a look at today, including Max Meyer, Julian Brandt and Niklas Sule. The time has come. The international friendly against Finland this evening will be my last match for Germany. This evening means a lot to me, all my family, friends and some acquaintances will be watching from the stands. I think it’s magnificent that I’ve been given the opportunity to say thank you like this. Of course I feel a bit sad but I feel a sense of joy more than anything else. I am so excited to hear the national anthem and play for Germany one last time. After twelve years of playing for the national team all that’s left to say is thank you. I would like to thank the DFB who have always succeeded in creating an exceptional atmosphere amongst the national team. My coaches, especially Joachim Löw, under his leadership I’ve become a better and more mature international player. My teammates with who I’ve continued to pursue our goals and achieve them. Also the support staff who do so much behind the scenes for the team. The national team is a total work of art. Thank you to everyone who has been involved. My biggest thank you goes to you, the fans. Thank you for your patience, your trust and your support. The pictures from the fan park, your excitement and your celebrations and emotions were all my motivation. What I can say for certain is that without you, mine and our journeys would not have been possible. When I look back on it all, I remember so many highlights. The home World-Cup in Germany and the progress made from 2008 to 2010. In 2012 there was a minor setback, but part of our success story is how we dealt with these blows. Then came the crowning moment in 2014. Even after that there were some great moments. For the last two years I have been able to captain this team, and for me it was incredibly special to be able to wear the armband. Today I can safely say that I have achieved a lot than anything I could have dreamed of as a child. This makes me both happy and proud. With this outcome I feel I can leave the side with a good conscience. The time is right to go and I leave with great satisfaction. Finland have a realistic chance of coming with a positive result, it seems. Only 1 Bayern player sounds good to me.